Apple held a splashy media event in Brooklyn on Tuesday to unveil its holiday menu of new laptops, iPads and other gadgets. 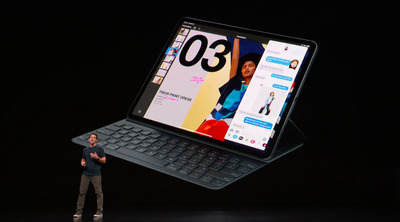 Unlike the big event Apple hosted at its California headquarters in September to show off its new iPhone line-up, Tuesday’s event was focused on computing devices designed for working and creating. A new MacBook Air that features a 13.3-inch Retina display with 4 million pixels, and replaces the aluminium border around the display with a black bezel. The new MacBook Air is 17% less volume than its predecessor and includes cool, new features like Touch ID. A new Mac Mini with up to 64 GB of memory (previously, 16 GB was the limit) and which is five times faster than before. The new iPad Pro has an edge-to-edge, 11-inch LCD “Liquid Retina” display. It also says workloads on the new iPad Pro are now up to 90% faster, and graphics performance is 1,000 times faster. The new Apple Pencil attaches to the iPad magnetically and charges wirelessly. The new MacBook Air, Mac Mini, and iPad Pro are all made from 100% recycled aluminium, a new alloy creation made by Apple’s metallurgy team.